July 2018 and businesses are still being affected by slow and unreliable broadband the talk has moved from Superfast Broadband to Ultrafast broadband. But whats the difference? In 2010 the Govt of the time set out its goal that the UK would have the best Superfast network in Europe. (Superfast typically being download speeds of 24 megabits per second or faster). 5 years later all change and that Government ambition was now changed to 100megabits per second or faster through full fibre ultrafast broadband. Superfast broadband is typically delivered in the UK where Openreach have installed a fibre network to your local BT cabinet and from that point to your property is connected through a traditional copper cable. This is called Fibre to the Cabinet (FTTC). The key here is broadband speeds degrade over long distances of copper so the further the distance from the cabinet the weaker the broadband speed is. Some Internet Service Providers (ISP’s) are advertising FTTC as fibre broadband which isn’t strictly true as its only part fibre. This has resulted in an investigation into misleading advertising practices by the Advertising Standards Authority (ASA) but unfortunately the ASA ruled if fibre is used for the majority of the broadband then Superfast can be called Fibre. Where Ultrafast broadband (or sometimes called Full Fibre or Fibre to the Premise (FTTP) is different is that its fibre all the way from the telephone exchange to the property therefore removing the copper element completely. This removal of copper means speeds are more guaranteed and higher speeds and more stable connections can be achieved. 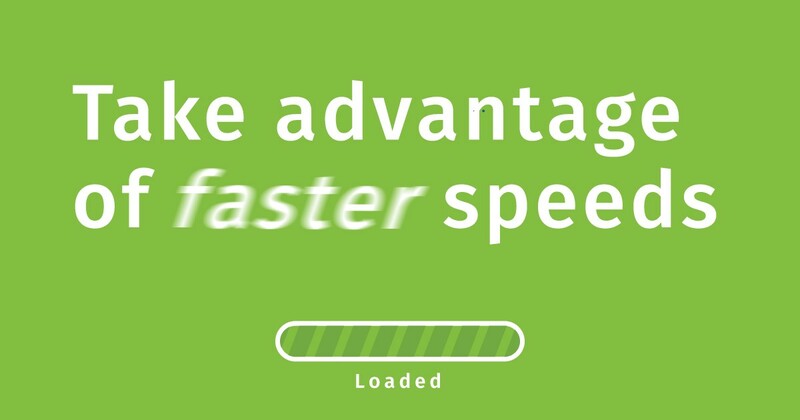 Are you looking for the fastest broadband in your area? Ultrafast is here in South Yorkshire TODAY. We are providing affordable broadband to companies today who are currently receiving download speeds of over 330mbps and massive upload speeds of upto 50mbps, and it really is revolutionising the way they work. Ultrafast is live in Doncaster in areas such as Redhouse Interchange, Hayfield Lane, Kirk Sandall, Sidings Court, Bullrush Grove and Balby Carr Bank. Its live in Sheffield in areas such as Sussex Street, Rotherham on Hellaby Industrial Estate and Barnsley at Capitol Close and J35a Industrial Estate amongst other areas. Just because your broadband provider hasn’t told you about it doesnt mean you cannot get it. What’s more there are 28 areas in South Yorkshire that are due to be connected to Ultrafast. These include areas throughout Doncaster, Sheffield, Barnsley and Rotherham. Contact us to register your interest. A lot of ‘experts’ class FTTP as future proof technology which is always a dangerous phrase to use. However, fibre optic cable has far more benefits than the old copper network the UK phone network was built on. Speeds typically don’t degrade, the cable is thin, light and flexible meaning it is easier to install than copper. Also, fibre isn’t affected by water. Water is the single most cause of outages on the copper network. We are aware of customers in Sheffield still having issues on their copper phone lines 10 years after the floods of Sheffield. A recent survey highlighted that internet outages cost UK businesses in 2015 an average of £521 per employee in lost productivity. Why wouldnt you want a more reliable connection? Ultrafast the key to a Digital age? Fast and reliable connectivity is key to economic growth. Did you know that for every £1 invested in superfast and ultrafast broadband £20 is generated in economic benefit? This has been achieved by businesses improving productivity, introducing flexible working, operating in new markets, and by new businesses being created in the digital, technological and cloud sectors. It’s not the size of your broadband it’s what you do with it that counts! Talk to us at KAT about collaboration tools that can increase business flexibility, improve customer service, and reduce costs through the use of hosted VoIP phone systems, video conferencing, file sharing and cloud storage. Evidence shows businesses that embrace connectivity to the max outperform those that do not. If you are worried about the initial costs of innovating your business don’t be. Our friends at Superfast South Yorkshire have launched an Innovation Voucher scheme designed to help support your quest to improve business performance. Call our team today on 01302 260195 or email to discuss how we can find you the fastest broadband speeds for your business and help revolutionise your business through our range of connectivity and cloud based solutions.